Ordinarily, you’ll never catch me frying. Stir-frying, sure. A little light saute, definitely. But full on frying, with oil measured in terms of cups, rather than scant tablespoons never fails to frighten me. Which is not to say that I’m averse to fried food. Take me out to eat and my usual qualms fly out of the window. It’s as though dining outside of the confines of my apartment gives me amnesia when it comes to what must have gone into the preparation of say, a french fry or an onion ring. While I can’t argue that a breaded chicken cutlet is anywhere near as fun as a fritter, I was more than pleased with the way these turned out. Crunchy and thin, crisp and golden, these breaded chicken cutlets from America’s Test Kitchen’s The New Best Recipe were the perfect meal for a quiet Saturday evening at home. Instead of the usual evening rush to pull together dinner, there was time to do the prep work including 30 minutes of brining, 10 minutes of drying, setting up the system of bowls for dipping and dredging, and then finally the frying. In other words, this is not a dish to make when you’re in a rush, especially because it generates an army of dishes. But on a night with some extra time, when you’re willing to take the time to enjoy the process of cooking, the act of making dinner, you’ll be please with the results. I would definitely make them again, but next time would probably take them to the next step, as The New Best Recipe suggests, and turn the cutlets into what must be a to-die-for homemade chicken parmesan. 1. Using a meat pounder or mallet, pound the chicken breasts to an even 1/2-inch thickness. Dissolve the sale in 1 quart cold water in a gallon-szed ziplock bag. Add the cutlets and seal the bag. Refrigerate until the cutlets are fully seasoned, 30 minutes. Line a baking sheet with a triple layer of paper towels. 2. 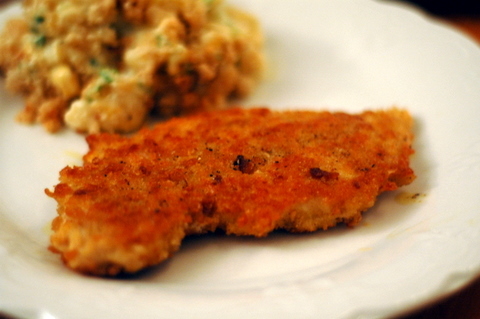 Remove the cutlets and lay them in a single layer on the baking sheet. Cover with another layer of paper towels and press firmly to absorb the moisture. Allow the cutlets to dry for at least 10 minutes. Carefully peel the paper towels off the cutlets; sprinkle the cutlets with pepper and set them aside. 3. Place bread crumbs in a shallow dish or pie plate. Spread the flour in a second shallow dish or pie plate. Beat the eggs with 1 tbsp olive oil in a third shallow dish. Working one at a time, dredge the cutlets thoroughly in the flour, shaking off the excess. Then dip the cutlets into the egg, taking care to coat them thoroughly and allowing the excess to drip back into the dish for a very thin coating. Dip the cutlets into the breadcrumbs, pressing the crumbs with your fingers to form an even, cohesive crust on both sides of the cutlet. Place cutlets in a single layer on a wire rack and let dry for about 5 minutes. 4. Meanwhile, heat 6 tbsp of oil in a heavy-bottomed 12-inch skillet over medium high heat until the oil shimmers. Lay two cutlets at a time in the skillet and cook until deep golden brown and crisp on the first side, pressing down with a wide metal spatula to help ensure browning, about 2 1/2 minutes. Using tongs, turn the cutlets over, reduce the heat to medium, and continue to cook until the meat feels firm when pressed gently and the second side is a deep golden brown, 2 1/2 to 3 minutes. Set the finished cutlets on paper towels on a warmed plate in the oven while you cook the others in the same way. Serve with lemon wedges.